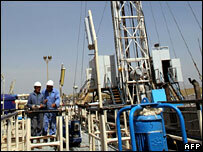 Oil production in Iraq has hit its highest level since former leader Saddam Hussein was ousted in 2003. Production has risen to 2.5 million barrels per day (bpd) from a steady 2 million bpd during the US-led invasion, Iraq's new oil minister said. Hussain al-Shahristani added that production was expected to rise to 2.7 million bpd by the end of the year. "We have been able to break records," he said of the government, which has been in place for just over a month. Before the war, output was around 3 million bpd, peaking at a record of 3.5 million bpd. During an interview with CNN, Mr Shahristani said that Iraq's target now was to challenge Saudi Arabia's position as the world's leading oil producer. To that end the oil minister said he expected output to rise to approximately 4m barrels per day by 2010, increasing to 6m bpd by 2012.